Friends, the clock is ticking. I am just about 3½ months away from a big birthday. Big as in huge. 40. Last July, when I turned 39, I set some goals for myself. Since I still have a few months to go, I will wait to fill you in on whether all the goals are met. (Here is a hint – yoga, yay! Croissants – not so much!). But now I can cross a big one off my list. Every single time I go into Holly B’s Bakery I either get a cinnamon roll, or I regret not having gotten a cinnamon roll in addition to whatever delicious item I did get. If I did one of those free association exercises and you said, “Holly B”, I would no doubt say, “Cinnamon roll”. You get where I am going with this. Holly B = cinnamon roll. And yet, in all years I have owned her cookbook, I have never made them. I can partly blame it on the fear of finding myself in the house with a dozen or so cinnamon rolls and partly blame it on timing. You see, this recipe ends with the dreaded words, “Serve still warm from the oven”. How do you time that? Now that I have made them, I kick myself for not just diving in sooner. It is not complicated. First you make a bread dough which needs to rise for an hour or so. Then you roll the dough out, do the brushing and sprinkling and the rolling back up. Then you slice and place on a baking sheet where they rise again for about 30 minutes. They bake for about 30 and then you eat them. Why did this sound so daunting? I wanted to bring these rolls over to a friend’s house for a post egg-hunting brunch. I made the dough and let it rise about and hour and a half before we left. I formed the rolls just before we walked out the door and let them finish their rise in her warm kitchen and bake in her oven. Then we feasted. Back to that free associate exercise. 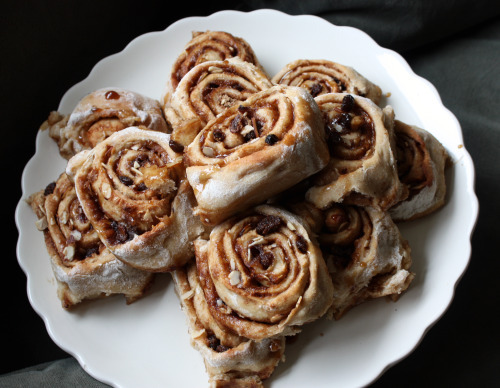 If I say “cinnamon roll” and you think “Cinnabon” then I would not advise making these rolls. They have very little in common with those shopping mall monsters (sorry, I am biased). 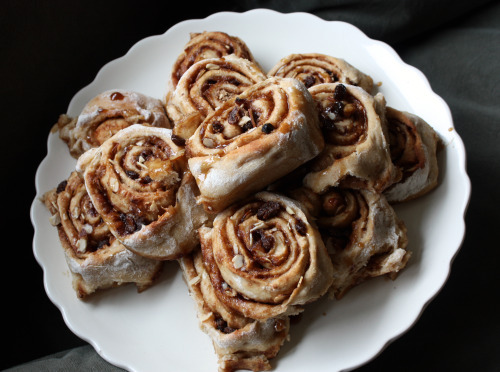 Remember, this is a bread recipe (that has a whole cup of whole wheat flour in it) which is rolled out, brushed with butter, sprinkled with two kinds of sugar, a full tablespoon of cinnamon, raisins, and sliced almonds. There is no icing and I wouldn’t want there to be. Because the roll itself actually tastes like something other than air, you actually want to taste that part. 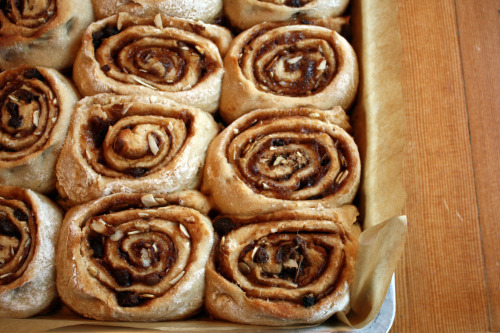 The roll is delightfully nutty from the whole wheat flour and the sugars caramelize just so. I always tell you how I don’t like nuts in my baked goods but I wouldn’t think of leaving those sliced almonds out. They are delicate and add a wonderful crunch and very subtle flavor. 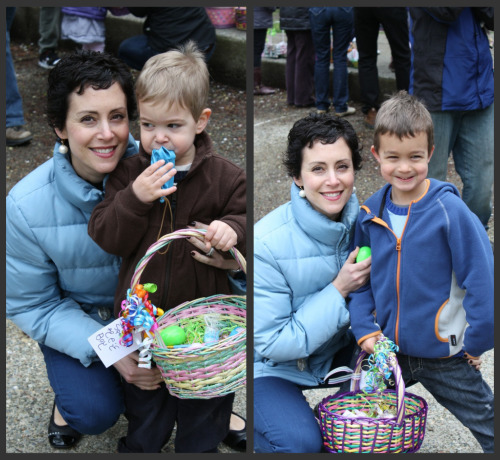 I wanted to get a picture of me with both boys but the Easter egg hunting was a little too exciting for them to both stand still at the same time. Separate was the best I got. Swish together the water, honey, yeast, and oil in a roomy bowl. Now dump in the flours and lastly the milk powder and the salt. Mix these dry ingredients gently with your fingers without breaking through to the liquid below. Lay a sheet of parchment paper down on a 10×15-inch baking sheet. Do not punch down the dough, but gently turn it onto a floured surface. Sprinkle the dough with flour and roll into a rectangle ¼-inch thick and approximately 10 by 25 inches with the short sides top and bottom. Check the underside of the dough frequently. Loosen any stuck spots and sprinkle on a little more flour. Brush the dough with the melted butter, coating well but not leaving puddles. Combine the raisins, almonds, sugars, and cinnamon. Distribute the mixture evenly over the buttered surface, pressing down on the edges so the filling won’t fall off when you roll up the dough. Starting at the short edge nearest you, roll up the dough, tugging gently to achieve a nice, snug long and keeping the edges even. Turn the log seam downward and use a serrated knife to slice the dough into 10-12 rolls. Place the rolls snugly in the pan. Cover with plastic wrap and let rise in a warm place until puffy and doubled in size, about 30 minutes. Before the rolls finish rising, preheat the oven to 375°F with the rack in the center position. Bake the Cinnamon Rolls for 15 minutes, rotate the pan, and bake for another 15 minutes more. The rolls should be light gold and no longer doughy inside. (DT: I think it’s best to check on the insides – mine looked done but were a little doughy.) Serve still warm from the oven. Hooray for posting this recipe. I’ve been wanting to make cinnamon rolls lately, but I’m not a fan of the sticky sweet Cinnabon-style ones. These sound perfect. And hey, we’re the same age – but my birthday is in about a month. Gulp! few people can pull off hair that short dana, you are a babe. So cute. Both you AND the cinnamon rolls that is. Ditto to Sara’s comment. Seriously. I hope I look half as good at 40 as you will! I wish I did now! mouth watering! not just the cinnamon rolls! Looks pretty amazing, friend! I can’t wait to try these! I’ve never been to Holly B’s, but every recipe you post from her looks divine. This one might have to wait until AFTER my weekend trip to sunny LA where I will hopefully be donning a swimsuit :) You look fantastic, as usual. The boys look happy. Happy early birthday. 40 sounds great! Dana, the cinnamon rolls look so yummie, I can almost smell them :-) Your boys are adorable! Love the Easter basket photos! These are truly delish! Glad to have the recipe now to recreate them at home! One more thing we share, apparently — age! With my bday in June, I’ll be beating you to this milestone by a few short weeks. I’ll send you a report from the other side! I share the cinnamon roll love with you and I love that these don’t require frosting! The images with you and your boys are so cute! Love your earrings by the way. 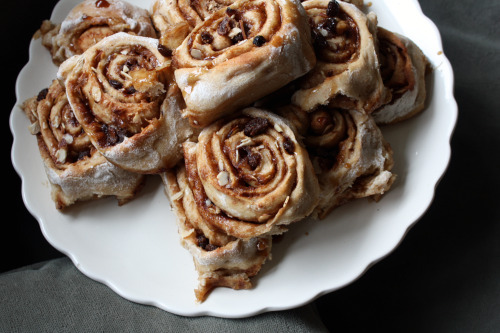 These are totally beautiful cinnamon rolls! I’m pretty sure I’d like the bread version of these more than the Cinnabon version, which makes me slightly sick to my stomach. These seem much more refined. In a high class kind of way. I like that in a cinnamon roll. I always add pecans or walnuts. Sliced almonds sounds like such a nice idea! OMG you look terrific! A credit to women especially the aging ones.Here’s a BIRTHDAY PRESENT for you. Wishing you many years of great cooking. Hope you’re another Clara! drool drool drool! There is nothing better than a homemade cinnamon roll w/ a big glass of milk! You look so stylish with your cute short haircut! I’m wondering if I can sub another milk product for the milk powder? Would it be too rich/heavy with 2c nonfat milk (instead of water) or would 1c water and 1c nonfat milk be better? We are the same age (well, I’m about a couple months older) and you are too cute. I love these cinnamon buns and I’m definitely not a fan of the sugary frosting that most have. I’ll be making these soon and definitely before my birthday. Right there with you about the Cinnabon rolls. Too much. I love me some cinnamon, but I can’t take those. These look so much better than a cinnabon! The sliced almonds sound great in them too. it’s nothing less than a travesty when icing that’s way too sweet masks the true flavor of a cinnamon roll. this recipe rocks. and hey–don’t fret about the upcoming birthday. just keep on keepin’ on! Great photos with your boys! I used to feel like cinnamon rolls HAD to have cream cheese icing but now I usually prefer them without. I love that this recipe incorporates whole wheat flour. They look amazing! Hi, I miss Lopez so much. I grew up splitting my time between our cabin on Whiskey Hill and our home in the U District in Seattle. Holly B’s is my favorite! I now live in Yakima, and I have LOST my copy of With Love and Butter in which Holly even inscribed a note for me. What a loss! Thank you for sharing a few things on here!! I hope to find a new copy…someday!